nation we*re so powerful as to endanger the specimen, or to introduce* temperature variations which would vitiate the results of the measurement. making use of the interference of light waves. 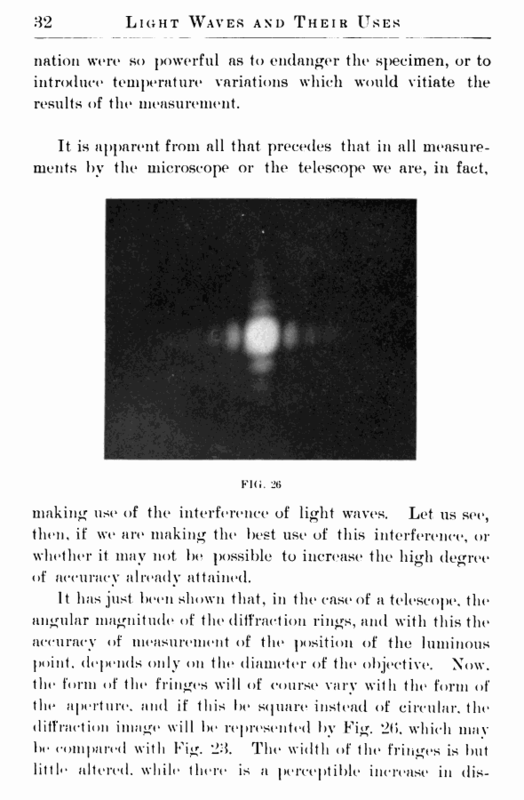 Let us see, then, if we are making the best use of this interference*, or whether it may not 1 Mi possible to increase the high degree of accuracy already attained. tinctness. Let the middle part of the aperture now be covered up, as in Fig. 27, so that the light can pass through the uncovered portions, a and 6, only. Fig. 28 shows the appearance of the fringes in this case. 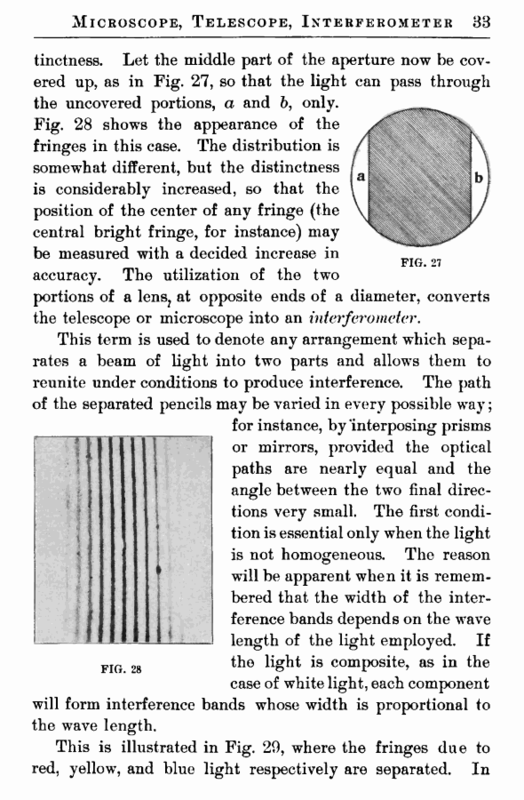 The distribution is somewhat different, but the distinctness is considerably increased, so that the position of the center of any fringe (the central bright fringe, for instance) may be measured with a decided increase in accuracy. The utilization of the two portions of a lens? at opposite ends of a diameter, converts the telescope or microscope into an interferometer. for instance, by interposing prisms or mirrors, provided the optical paths are nearly equal and the angle between the two final directions very small. The first condition is essential only when the light is not homogeneous. The reason will be apparent when it is remembered that the width of the interference bands depends on the wave length of the light employed. If the light is composite, as in the case of white light, each component will form interference bands whose width is proportional to the wave length.